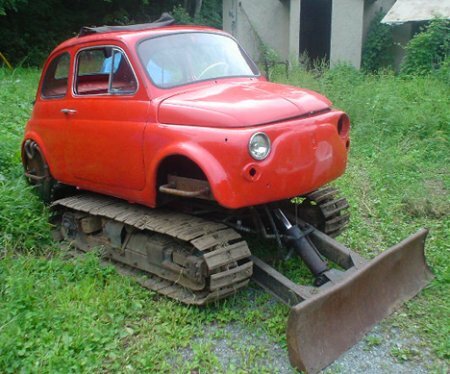 Now this is one vehicle that ought to get the neighbor to sit up and take notice – even if he already owns a fleet of vehicles and take exotic holidays all over the globe, but chances are he’ll never be able to own this Fiat Cinque Tank right in his garage for one simple reason – it is custom built using an old Fiat 500 (preferably unwanted) body that has been mounted onto caterpillar tracks of a secondhand tractor. You won’t break any land speed records with this as it plods along to a maximum speed of 3km/h, but it will definitely boast a look that is guaranteed to turn heads. Also, it can do its fair bit in a yard thanks to the working power shovel.